Why poke? Why now? It seems that in just the past few months, hip restaurants are offering bowls of the Hawaiian dish, not just Asian or island-inspired places, but almost anywhere. Here in Tucson, having a refreshing nosh that comes replete with rice, raw fish and some cool and crunchy toppings sounds good when the sun is beating us up and the wind is like a blast furnace. But in rainy Northwestern territory or the snowy banks of Canada? You would think a piping hot bowl of pho would go down better with some belly-warming satisfaction. It's just one of those "it factor" culinary furors that is happening right now and there is really nothing we can do about it. But the thing is, do we want to do anything about it? Not really. Originating on the big main island, poke started out as a quick bite for the local fishermen using pieces of tuna or octopus that wouldn't sell at the local market. They would throw it on some rice, add a bit of seasoning, maybe some dried seaweed, and there you go. Through the years the simple dish caught on and soon enough it could be found in almost every major metropolitan city. Tucson is no different. We now boast over a dozen restaurants that offer up versions of poke, but it took two grad school friends to turn it into a fast-casual concept. Mobeen Moslem and Kevin Tran met in pharmacy school at UA, but when an opportunity to go in business for themselves arose, they jumped at the chance. After Rice House China Thai shut down, Mobeen and Kevin moved in. Taking inspiration from various trips to California, where poke shops are abundant, they knew that setting up a poke shop on the well-trodden stretch of Congress would go over quite nicely. "We are both big fans of poke, and we just wanted to bring something healthy and fresh to downtown Tucson," Mobeen says. Having just opened this March, Poke Zone was an almost immediate hit with the downtown lunch crowd. It's easy to see why. The place is really slick, really clean, and the fact that you can pick what you want for your poke bowl adds a bit of creativity to your meal. You can either choose from white rice, brown rice or a salad base, or go half and half if you want, then select your protein. Right now, the restaurant offers spicy tuna, salmon, yellowtail, octopus and ahi. Then you can finish off with one of the six house sauces and a slew of toppings, including wasabi, crispy fried onions, pickled ginger or furikake, which is a Japanese seasoning made with dried fish, seaweed and sesame seeds. To keep with the old-time tradition, I opted for the ahi and octopus over white rice, eel sauce, some edamame, avocado, seaweed salad, crab mix, jalapenos, cucumber and chili flakes. This will run you around $9.25, but it is a hearty bowl of sushi grade awesome. Having had poke along the California coast, Poke Zone comes pretty close to the flavors of fresh catches from the reefs and beaches of the Pacific. The factor of raw fish and sticky rice, among the throngs of various other elements dotting the colorful mound, fills you up rather nicely. That belly full stays with you for quite a spell so be sure to get to a refrigerator pronto because if you're having an after-work snack, you're going to want to dive back into some Poke Zone leftovers. 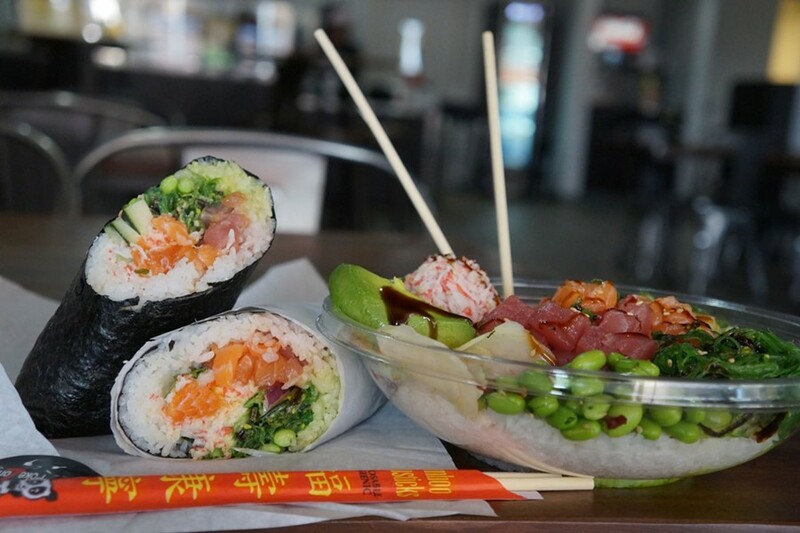 Another trend that Kevin and Mobeen have adopted is that of the sushi-rito. For those that are unfamiliar with the slightly intimidating sushi-rito, a sushi-rito is essentially a mighty sushi roll the size of a burrito but instead of a tortilla, it's wrapped in seaweed. These things are crazy. Sushi-ritos can be kind of tough because that is a lot of salmon, rice and spicy mayo to be taking down. Like, you have to be dedicated to that particular roll. I did my best with the version at Poke Zone and, just like their poke bowls, I was really full for under $10. It was fresh, tasty and a pleasure to hang out with on a hot afternoon. Currently a full bar is in the works and more tables and chairs are on the way. When that does happen, which will be in the next few weeks, my prediction is that Poke Zone will be a big contender in the downtown food and bar scene. Just take it from two bros that happen to be pharmacists: If you're downtown and hungry, they have the cure for the stomach-rumble blues.